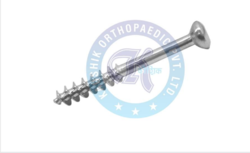 Operating from India, Kaushik Orthopaedic Corporation is engaged in the manufacture and export of Bone screws, cancellous screws, orthopaedic cortical screws and malleolar screws. We are one of the most reliable organisations in our sphere catering to various hospitals. Backed by sophisticated infrastructure facilities and well trained professionals, we are engaged in manufacturing and exporting an exclusive range of Malleolar Screws. 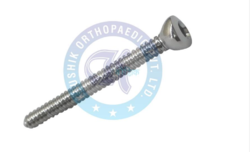 these screws are used ot provide the relax to patients in fracture or other problems like angulation. From the past couple of years, we are engaged in manufacturing and exporting a huge variety of Cancellous Screw. 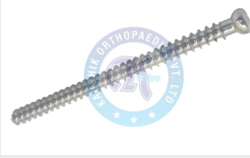 Due to their exceptional qualities and unique attributes, these screws are extensively demanded and praised among the clients all over the world. by utilizing the sophisticated technology tools and premium grade materials, we have fabricated these screws in adherence with the industry standards. 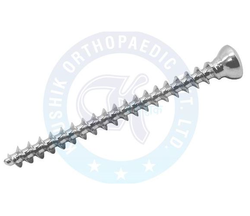 Our esteemed and valued clientele can avail a large gamut of Cannulated Cancelleous Screw. These screws are known for their smooth finishing, durability, optimum strength and finest quality. Adhered to international quality standards and norms, these screws are available in 6.5 mm and 7.5 mm. ranges that appropriately meet each and every demand of the clients.